Record-breaking figures, representativeness of the sector and strategic importance in the planning of investments contribute to the visibility of the only sector trade show with international appeal and enabled even the edition 2018 of BI-MU to enter the network of the most important world machine tool exhibitions, also including CCMT Shanghai, IMTS Chicago, METALLOOBRABOTKA Moscow, JIMTOF Tokyo, CIMT Beijing and EMO Hannover, the world exhibition dedicated to the metalworking sector, alternately held in Germany and Italy. Thanks to this “partnership”, the promotion of BI-MU is able to reach all major international events of the sector, while increasing 31.BI-MU and its protagonists visibility to the whole international public. 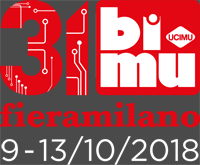 The promotion of BI-MU is carried out through a series of initiatives conceived to bring the event to the attention of the whole universe of operators and to offer exhibitors communication and services instruments.